Love at first sight is something many of us wish for. We’ve all been there. That newly released hardback that you just know you will love the instant you lay eyes the cover. These are books that stir something within our book loving souls and transport us to a new place. Wish by Barbara O’Connor was that book for me. A friend had posted an image in our Voxer chat and it was book love at first sight. I wished I had a copy. As luck would have it, my wish came true. I entered and won a Twitter ARC giveaway and soon had my own copy to read. Upon its arrival, I stared longingly at the cover. The purple haze and swirls of color pulled me into Barbara’s world without having read a single word. I was developing a major book crush. In my heart, I was there in the twilight with a girl and her dog. I wished to know them. I started Wish and met Charlie. A young girl who is moving in with her aunt and uncle until her mom is able to “get on her feet” again. She’s leaving her home, friends, and even his sister behind as she’s thrust into a new town filled with strangers. Charlie reminded me of beloved characters like Hollis Woods and Carly Conners. She was smart yet standoffish. And a little bit, okay a lot, feisty. Charlie didn’t need to like this new town or new family because she wasn’t going to be there long. Charlie knew her mom was bound get out of bed and get her feet on the ground in no time. For her sake, I too wished for Charlie’s mom to crawl out of her depression. Yet, Charlie finds herself chasing after a stray dog and making friends despite her own objections to these “squirrel eating hillbillies.” As Charlie began to settle into her new home among the Blue Ridge Mountains, I too began to feel at home in North Carolina. I was there watching fireflies dance from the porch with a snoring dog at my feet. I was sipping sweet tea and smelling rain soaked tomatoes ripening on the vine. I was immersed completely in Charlie’s world. Like fog off the mountains, Bertha and Gus’ home settled around me and blurred the lines of reality. I wished for Charlie to realize the beauty of the people and place surrounding her. Slowly, Charlie discovers what I had seen all along, the magic within the mountains. Howard, her new best friend is insightful and honest beyond his years. Soon Charlie finds loyalty among friends, family, and a dog. She begins to know and love a world that she always wished for. As a reader, how could I not too fall deeper in love with Charlie and her family? As Charlie kept her making her own secret wish, I too began finding ways to make my own wish as well. A soft blow on a dandelion or silent wish on a twinkling star. Would Charlie’s wish come true? Would mine? 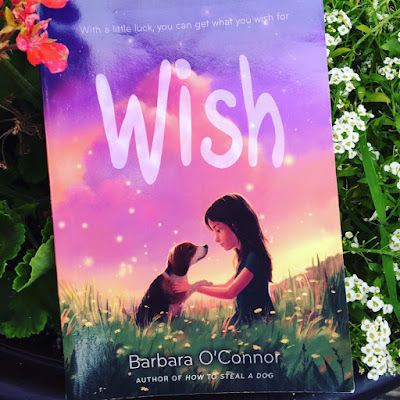 I had wished for a book to love and share, and I found that story within Barbara O’Connors’ Wish. This story was a work of the heart. Barbara’s craft and storytelling are nothing short of magical. Wish transports you to summer in the Blue Ridge Mountains and you won’t want to leave. Pieces of Wish are still lingering within my heart. Pulling at the strings and weaving its way into a forever favorite. Sharing Wish with teachers and students has allowed me to live a little longer in the foggy haze between fiction and reality. Alas, did my wish come true? My secret wish is that my students will find a warm spot on the front porch and allow Wish to settle in their hearts and transport them to a world filled with fireflies and friendship. Oh, Amanda!!! Thank you so much. What a wonderful review! faktor yang meningkatkan risiko kanker ovarium. Stories are like by the people more. Of the stories come out then their is no age limits. stories attract the younger, youth and aged people more. As it gave a essay service review and a beautiful lesson to the people which some one can use it in their daily life and can become successful. One can also use it conclusion in their daily life decisions.